Khorosho Productions: Statuesque @ Salute and FREE P&P Weekend! I've mentioned it before but the full Statuesque Miniatures range will be at Salute with Fenris Games tomorrow! Head along to stand TB02 for all the great Fenris stuff, Bronze Age minis stuff and of course Statuesque Miniatures! For those of you who, like me, won't be at Salute, we are offering FREE Postage and Packaging on all orders of £50 or more! This offer runs until Sunday night so head over to the Statuesque Miniatures store now to grab some girls. 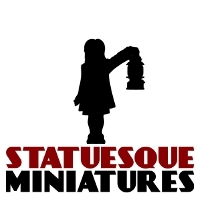 Today also saw the first Statuesque Miniatures Newsletter. If you hadn't signed up to get it, you can view the Newsletter HERE (there may be a couple of sneak peeks in there...). Don't forget to sign up so you won't miss the next one! ugh man you're killing me. now I'm thinking of switching back to your stuff again. Your stuff is just soooooo pretty. Cool, that's what I was going for: a quick check through the binoculars or a yell down the radio for back-up then off moving again. If I may be so bold as to make a few comments, I do think that the second pose seems a bit awkward with such a heavy gun. Testing the pose myself I feel that perhaps a hand on the right knee/thigh might be more comfortable? Also, I tried using Eva's head on the normal resistance fighters, and the impression I got was that it looks a tiny bit small. Perhaps this is because the hairdo is less voluminous than many of the other heads, but since you said you had some heads re-printed perhaps it could be another case of underestimating the "proper" size? No offence meant, of course. There are plenty of other great heads to go around if it's only me. I may also have had some half-waking hallucinations about plasma pistols. At any rate, some more light guns/handguns and aiming arms for the officers would be cool. I'd like to end with a slight paraphrase: I'm only complaining because it's good enough to be worth it. No probs, Adrian, all comments taken in good spirit. Since I've been prepping the Recon team for printing I've decided to use the same arm position (that of the first figure) on both. I'm limited in the arm position because of the need to work with the Officer Weapon sprue, but I think I was trying too hard for variation with the second arm pose. Looks too much like she's waving her gun around at the moment! Eva's head? Well, it works for me, definitely less bulk due to the haircut, which perhaps does change the perception of things. No chance of a reprint though, at least not until she needs remoulded. I'll see how I feel then. Thanks for listening. I was definitely not suggesting a reprint of her head (that would be rather extreme), merely that you'd perhaps err on the side of larger heads than smaller with any new models. I think perhaps it was most evident to me on the standing-straight pose, where the linear height may play tricks on the eye with regards to the proportions. But, as I said, it may very well be just me. I feel compelled to note that, apart from the ponytail heads, I unexpectedly liked the knit cap ones the best. They somehow completely alter the feel of the miniatures. Splendid work. Your comment was very well timed, Adrian, as I actually want back and checked the next lot of heads to make sure they weren't going to be too small, widening some by a percentage point or two in a couple of cases. Eva's head is a strange one. I've noticed it only really works on the figure in the pose she was designed in; looking in the opposite direction doesn't work for me. Her head is the same width as most others, but her face is differently proportioned, which may be what's up. That and less hair I guess. If you make another order, remind me and I'll send you a master casting of Eva's head sprue. The master is every so slightly bigger!